Dr Christopher Segler lecturing on Runner’s Heel Pain in Seattle. 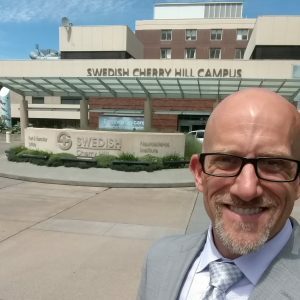 This past Thursday June 15, 2017 I was invited to lecture on Runners Heel: Pearls for Podiatric Physicians at the International Foot & Ankle Foundation Meeting conference at the Swedish Medical Center in Seattle, Washington. 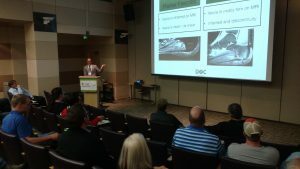 The attendees to this conference included podiatrists, foot and ankle surgeons and sports medicine specialists. The lecture was on runner’s heel pain and I was discussing the differences between plantar fasciitis, infracalcaneal bursitis, neuritis and stress fractures of the heel bone. The goal was to try to explain to doctors the ways that they could tell the difference between all these conditions in runners how they can help their patients continue running even if they have a partial rupture of the plantar fascia or plantar fasciitis. This is a great question because I mostly see runners in my practice, I think it is important to weigh the potential benefits of a corticosteroid injection against the special risks that cortisone can pose to runners. It is critical that we as physicians actually give special consideration to the runner’s plans and goals when considering cortisone injections for heel pain. 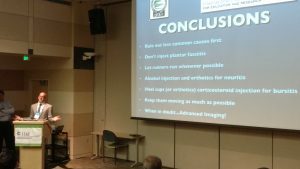 To further explain to the audience how runners are at high risk of developing partial ruptures or tearing or the plantar fascia after treating plantar fasciitis with cortisone injections. There are a number of case series published in medical journals which report unusually high proportions of runners who suffered partial ruptures of the plantar fascia after cortisone injections. Knowing that corticosteroids can weaken collagen bonds, it should not be surprising to doctors when a small tear in the collagen fibers becomes further compromised as an unintended consequence of the injection. Although a cortisone or ‘heel spur’ injection is likely the most common injection performed by podiatrists for the treatment of plantar fasciitis, it doesn’t mean plantar fascia injections should be routine for runners. Running places high stresses on the lower extremities, particularly the plantar fascia. If a runner has a particular running form, the biomechanical consequence of that running form can be to strain the fascia to the point of injury. If we inject the fascia with cortisone in an effort to calm the inflammation, but do nothing to address the underlying biomechanical forces which stressed the fascia in the first place, why should it heal? The stress hasn’t changed. I think that when we inject cortisone the inflammation calms down. The fascia feels better, but the fascia can become weaker. The runner, predictably begins to run more because the fascia finally quits hurting. This produces an unfortunate confluence of weaker collagen fibers and increasing biomechanical stress on the fascia. A partial rupture of the plantar fascia can result from that unfortunate combination. However, there is a time when I do consider cortisone injections for plantar fasciitis in runners. Let’s say you see a runner who has been trying for years to qualify for an event like the Boston Marathon or Ironman Hawaii. This may be a once-in-a-lifetime opportunity. In those cases, I will explain the risk to the runner, but then inject it so they can make it through the race. In some cases it may be worth the risk for the relief and short-term gain. But this is why it is so important physician and runners to talk candidly about the importance of upcoming races, current training plans, and long-term running goals. If the runner can speak openly, and the doctor will listen, the two can work together to decide whether or not injecting the plantar fascia really makes sense. A follow-up question was whether or not I would inject a partial rupture with cortisone. My is answer, “No way! Just too risky.” If the plantar fascia theoretically must develop plantar fasciosis (where the collagen degenerates from the chronic inflammation and repeated microtrauma) before it can rupture, then the fascia is, by definition, already weaker. 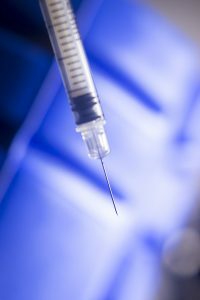 Injecting a substance that can further weaken the fascia may be asking for trouble. If a partial tear in the plantar fascia evolves into a full-rupture whereby the plantar fascia ligament rips all the way across the bottom of the foot, the architecture of the foot can change. The arch can collapse. 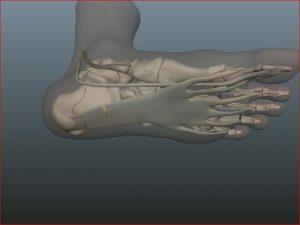 The spring ligament and other supporting structures can stretch out as well. In the end, if the arch collapses, the runner will never be the same. Although I think there are very few events warranting that sort of risk, it is really still the runner’s decision. But it is the doctor’s responsibility to explain the gravity of the risk to the patient, if she really views some particular event as a once-in-a-lifetime opportunity. What about PRP for partial ruptures? This is a great question. Given the number of articles written about the promise of faster healing with Platelet Rich Plasma (PRP) injection it just makes sense that runners would ask about it, and want it. But I explained that he has a routine which works well, without the added cost of a PRP injection. All it takes is a brief period of non-weight-bearing immobilization followed by a period of immobilization and protected weight-bearing. The length of time can vary, but the treatment is deliberately customized based on the individual runner’s response to treatment. 1 Fully protect the plantar fascia from stress and strain to allow the tear to heal by first laying down some disorganized collagen at the site of injury. 2 As soon as there is discernible improvement we know that some new collagen has formed and decreased tenderness of the healing plantar fascia. 3 Then we systematically re-assess and advance stress and strain in a way that restores motion without tearing the newly formed collagen repairing the plantar fascia. So if we can do this in a relatively short period of time in these physiologically advantaged runners, why waste the expense of the PRP injection. If I could say with confidence that a PRP injection would speed the healing of a partial rupture of the plantar fascia, I would do it. But I simply can’t say that. I can’t look a runner in the eye and tell her she will definitely heal 2 or 3 weeks faster if we add PRP to my routine. However with plantar fasciosis, the story is quite different. When a runner develops a case of plantar fasciosis, the collagen fibers start to degenerate. The plantar fascia starts to get thicker. That increased thickness of the plantar fascia can cause a serious problem. If you think about it, the thicker structure takes up more space. Essentially, aside from the inflammatory issues, you can have ongoing pain just because the fascia is taking up more space. It’s important to do something to reduce the thickness of the fascia itself. Platelet rich plasma injections have been shown to stimulate remodeling of the plantar fascia in a way that helps the fascia return back to a thinner, more normal thickness. That is part of the reason I routinely recommend platelet rich plasma injections for runners with plantar fasciosis. The big difference between runners with a partial rupture and those with plantar fasciosis is that one will almost certainly heal without a PRP injection. But I believe the other really and truly does need a platelet rich plasma injection to get the fastest possible healing and return to running. The other reason that I don’t routinely recommend PRP injections for partial ruptures of the plantar fascia is that we are injecting with a relatively large needle. The needle is sharp. But the needle is also big. The big sharp needle passing through the partially ruptured plantar fascia will cut and lacerate even more fibers of the plantar fascia. So in my mind, this could potentially disrupt some of the remaining fibers that are needed as a scaffolding to repair the torn plantar fascia. If a runner has a partial rupture of the plantar fascia and wants the most advanced, newest treatments to help stimulate healing, I would be inclined to recommend a stem cell injection rather than a platelet rich plasma injection. 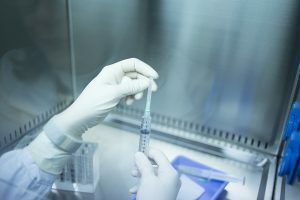 The stem cell injection has the advantage of a much smaller needle. So we can inject stem cells into that area to jumpstart the healing process without as much risk of lacerating remaining collagen bundles in the plantar fascia. Yes. In fact, extracorporeal shock wave therapy in much the same way, by some of the same mechanisms as platelet rich plasma injections and stem cell injections. But there are two main reasons that I don’t do shockwave therapy as frequently as PRP injections. The first reason is simply logistical. Shockwave therapy has to be performed in the office and the equipment is brought in by a vendor. So it’s a little more complicated to schedule. The second reason is that I do have some concerns that those 3200 high energy shock wave impulses that we typically do for shockwave therapy treatment may traumatize the heel in such a way that it could put runners at risk of developing calcaneal stress fractures. Although I don’t have any proof or real evidence that this is a valid concern, it has occurred to me. The patient to seem to end up insisting upon extracorporeal shockwave therapy are those who have relatives or friends who successfully overcame their heel pain after having shockwave therapy. Again, I do think it is useful therapy for chronic cases of plantar fasciitis and plantar fasciosis. The recovery and the cost of the procedures are similar. The main take-home point for runners is that you have to really understand the slight differences between Advanced treatment options. If you understand the pluses and minuses and other different options then you can make the best decision. Above all else, it is crucial to explain to your doctor that you want to continue to run. Make sure you explain the type of training you’re currently doing and what you hoped to do right after the procedure. The best treatment is never a single procedure. The best treatment is the treatment that is most likely to work for you, given your history, the amount of damage to your plantar fascia and your particular running goals. Dr. Christopher Segler is a nationally recognized expert on running injury treatment. He is also an appointee of the Faculty and Board of Medical Advisors, 2017-2019, International Foot & Ankle Foundation for Education and Research, Everett, WA. If you are a physician who treats injured runners, you can see his presentations in person at the upcoming IFAF Las Vegas, Nevada September 28-30, 2017 and IFAF Maui, Hawaii October, 16-20, 2017.